Joe Danger developer Hello Games announced its next game at the Spike VGX awards, a massive, procedurally generated, sci-fi exploration sim called No Man's Sky. 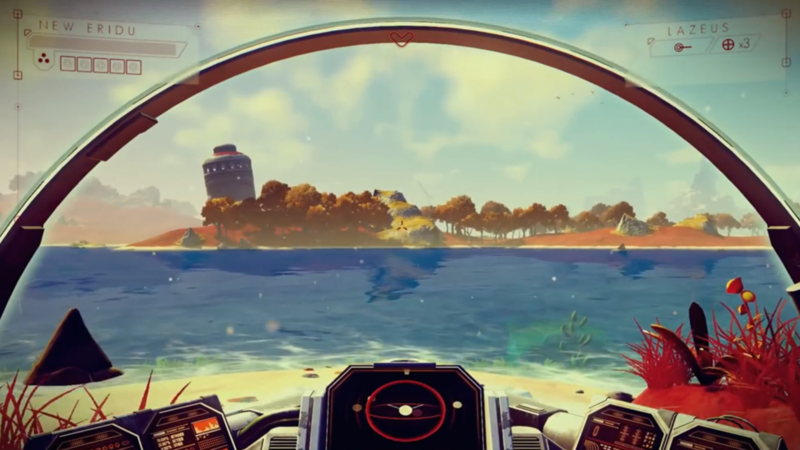 In the game's debut trailer, No Man's Sky was pitched as an exploration game where "every atom" is procedurally generated, from flora and fauna to the stars in the sky. Every planet and every galaxy is procedural, and filled with unexplored territories. The trailer shows that players will be able to explore underwater environments, the surfaces of planets, the skies and outer space in spaceships. 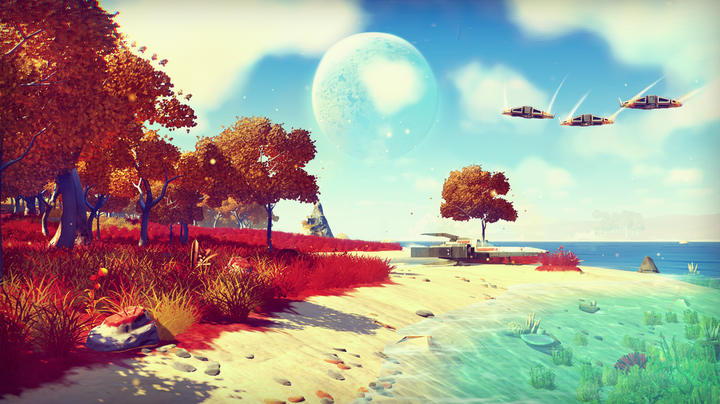 "It's a huge game," said Hello Games' Sean Murray. "We wanted to make a game about exploration. And we wanted to make something that was real." Murray said that, on planets, if you can see it — whether it be a mountain miles away in the distance — you can walk there. The game's persistent world is being created by the small team at Hello Games, and puts players into an ecosystem where they're not at the top of the food chain, Murray said. 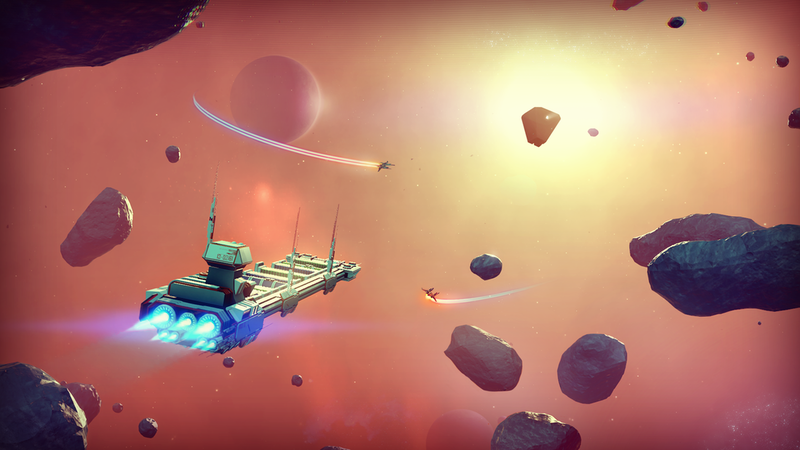 Space-based combat against other players and capital ships appears to be a major component of No Man's Sky. We'll have more from No Man's Sky soon, but here's the game's debut trailer. Loving the #VGX show tonight, especially the awesome announcement from @hellogames as we love those guys!Also gratz to @Naughty_Dog !!! You're in a used book store, lurking in the fantasy and sci-fi section, rummaging through a box of old novels. You see a fat tome with a flea-bitten cover featuring a garish technicolor vista of a strange new world, a grandiose title. On the cover, the artwork speaks of multiple moons, distant purple mountains, alien botany. In an instant, you understand that you will buy this book and, for the next few days, its mysteries will be a rapture to you. That's the feeling the developers at Hello Games are aiming for, with its new game No Man's Sky, revealed at the weekend with a first trailer. Its otherworldly colors, the slightly odd title and the focus on interplanetary exploration all speak of Asimov-esque tundras stretching into the distance. But this trailer poses as many questions as it answers. Many game developers will earnestly tell you that their creations defy categorization, and Hello Games' Sean Murray is no different. He stresses that although this game clearly involves space combat, exploration and resource gathering, it's not really about any of those things individually. He said that there is also land-based combat, not shown in the trailer, but would offer no more details. Based in England, Hello Games is known for its Joe Danger games, charming platform-drivers that hark back to the purity of character-led cartoon games made during the Genesis / SNES era. They were good games and have sold over a million copies. No Man's Sky is not, according to Murray, a project born on the back of Joe Danger's success. It was part of the company's plan when it was set up by four programmers and designers, each of whom had spent some years learning their craft at various game development houses in the London area. "A lot of indie game developers make something good and then they plateau," he told Polygon. "We saw Joe Danger as a stepping stone to get us here, so we can risk everything all over again." Murray and his team want to make sci-fi that dreams of new possibilities, that eschews the dark cynicism that has dominated that genre in recent years. They want to get back to the bright, garish promise of strange new worlds, and away from the gray, broken cities and the gruff space-marines. "We want the future to be cool again." said David Ream, creative director. Still, we need to at least try to define No Man's Sky. Hello Games is being cagey, but here's what we know. There is a universe to explore. Every planet and every star-system in the game is created procedurally, but they all make sense and have ecology. Once they are discovered by one player, they exist for everyone else, and so the act of discovery is also an act of creation. Having said that, according to Murray, players can make significant changes to the places that they visit that endure for everyone else. Make of that what you will. Players begin the game at the outer perimeter of the universe and are invited to move towards the center, although this is a difficult quest that takes "intelligence, imagination and co-operation," according to Murray. The universe is a dangerous place, and so there is plenty of combat and peril. It's not just about wandering around looking at the pretty fauna. . But the desire to go out there and look at the universe is at the center of this game's emotional appeal. Murray was born in Ireland but spent his formative years in the extreme outback of Australia, a hostile and beautiful place, but also one marked by isolation. "As a child I would look at the sky at night and all the stars and I would want to visit them," he said. "That's the feeling I got later, when I would read books from the golden age of sci-fi, from the '60s and the '70s, and that's what we want to do with No Man's Sky." Hello Games is a small developer with big ideas. Murray said that, while this game is pretty, it is not a next-gen sci-fi graphical showpiece like Titanfall or Destiny. "Next-gen is empowering us" he said, adding that no decision has been finalized on the particulars of release dates and platform choices. "The new consoles are really good. But most of the games we have seen feel like experiences you could have had with the last generation. They have next-gen graphics but we are more interested in creating next-gen gameplay." Hello Games, the studio behind Joe Danger and the upcoming No Man's Sky, announced via Twitter on Christmas Eve that the studio "has been totally flooded" as a result of severe storms in the U.K. Taking to Twitter earlier today, the studio's official Twitter account tweeted that the studio had gone under water and that "everything in the office has pretty much been lost." The tweets can be viewed below. No Man's Sky, Joe Danger developer Hello Games' procedurally generated space exploration game, is coming to PlayStation 4, Sony announced during Sony's E3 2014 press event. Sony accompanied the announcement with a trailer that began on a planet's surface, complete with foliage and extra terrestrial wildlife and took the the stars and planets, which were discovered and named by other players. Revealed last December during Spike's VGX event, the developers pitched a game where "every atom" is created within the game by the game's engine. 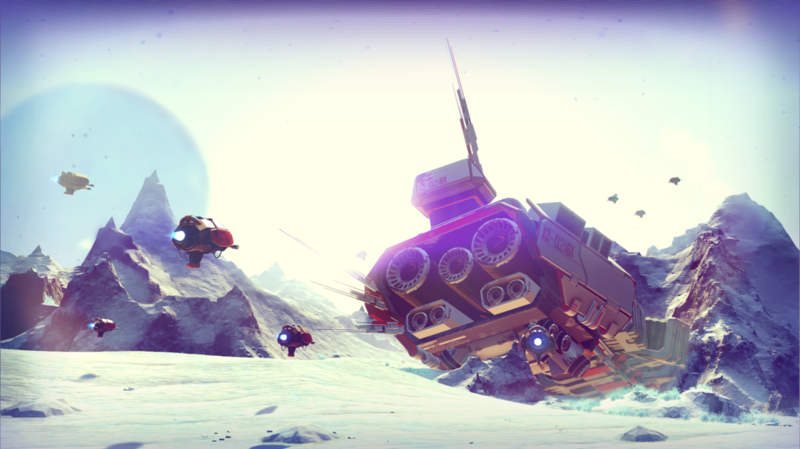 In No Man's Sky, players will be able to explore planets and solar systems. For more on Hello Games, whose Guilford U.K. offices flooded last Christmas Eve, be sure to read our interview with founder Shaun Murray.